1) To identify, select and train entrepreneurially inclined people to start up a business of their own, so that they can change their circumstances. 2)	To identify and build relationship with community-based people and organizations around the world that have a vision to empower their communities economically. 3)	To empower these people and community-based organizations to organize, facilitate and deliver the DBSP training in the country and/or region and/or areas in which they work. 4)	To partner with and license the Trainer/Facilitators and organizations to run DBSP training. 5)	To provide back up support services to the Trainer/Facilitators and organizations. 1) To identify and train entrepreneurially inclined people to start up a business of their own, so that they can change their circumstances. One of the major cricises facing our world, whether it be a third-world or a first-world country, is that there simply are too few jobs for vast numbers of people that need to earn an income in order to live. This situation is getting worse year on year in nearly every country on the planet. We cannot rely on governemtns, nor organized business to create jobs in sufficient numbers to ensure everyone of workable age is gainfully employed. The situation is further exacerbated by mechanization, labour unrest and global competitiveness to make products cheaper and the wholesale importning of cheaper products. In order to try and combat the unemployment crisis, the DBSP offers an opportunity to entrepreneurially inclined people to learn how to start up a business of their own and thus become self employ, utilizing their own circle of resources. Having said this, we face another problem - and one that the DBSP tackles head on - that of the very high numbers of businesses that fail soon after starting. (This can be anywhere from 1 to 10 years after the business has been started.) Without going into too much detail, the 3 chief reasons that businesses fail is a) the lack of functional general knowledge on the workings of a small business, b) the lack of proper, in-depth research that a prospective small business person puts into his/her idea (This includes the failure to identify a true, authentic busines opportunity) and c) The lack of mentoring and coaching that a new small business owner needs in order to succeed. The DBSP training focuses on all of these key areas in its training interventions. In terms of the two paragraphs above,the DBSP puts special emphasis on the out-of-work, the retrenched, the graduate who can't find work and on the poor, inclusive of marginalized groups such as those affected by HIV/AIDS, and the physically challenged. Having said the above, the DBSP prefers to seek out and empower other organizations to run its programs through, rather than to offer the training itself. 2) To identify and build relationship with community-based people and organizations around the world that have a similar vision to empower their communities economically. Due to the sheer need all over the world, it is impossible for the DBSP to function as one multi-national organization. This would also require substantial resources. Therefore the DBSP operates through a series of strategic partnerships with community-based organizations and/or individual people in the countries / regions and areas in which we currently work and will work in in the future. We are constantly on the lookout for like-minded and like-valued organizations and individuals in countries, regions and areas that we can empower to run the DBSP training interventions, so that they can empower their own constituencies from an economic point of view. In order to find out how you can become a strategic partner of the DBSP, click here. As part of this activity, the DBSP identifies areas and communities around the world that require business start-up training and, through partnering, we run our training programs in these areas and communities. Before going on, it is important to understand the DBSP's philosophy on community development. This is to carefully select certain areas within a community and to work in these areas as thoroughly as possible, widening our circle of training ever outwards, like ripples in a pond. The DBSP does not subscribe to the "shotgun approach" to training, which is training for the sake of running programs and having as many learners go through the programme as can be. The DBSP trains for impact - and that is to have as many of the learners as possible start up and run a business that will sustain. The "shotgun approach" is one in which many programmes are run in many different areas, but without any integrated approach and planning for the economic development of the area as a whole. It is a quick in and quick out approach and one that has very little impact in the long run. The DBSP certainly does not subscribe to such a methodology of training. 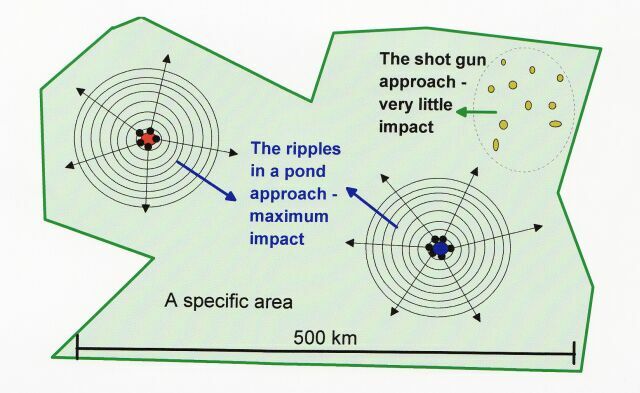 The 'ripples in a pond' approach is much slower to implement than the 'shot gun' approach, but it is more thorough and the outcomes are more sustainable. By adopting such an approach the entire community can be transformed economically, because jobs are created and a micro economy is set up within the region. 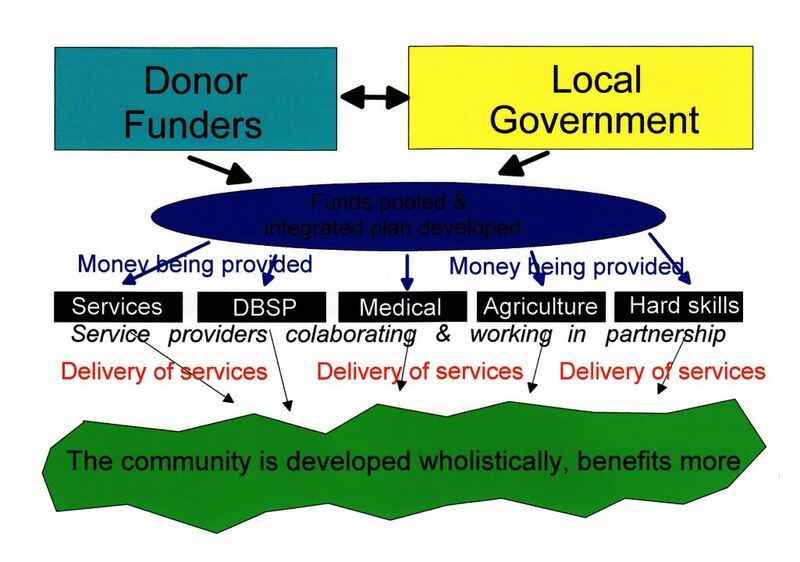 In terms of the types of organizations the DBSP likes to partner with, these can be organisations doing various things such as HIV/AIDS work, social development, housing, service delivery, health services, orphans and vulnerable children, farming, food security, tourism, arts & crafts, forestry, water, or any other form of community development, where an economic development component would be needed. In terms of partnering, the DBSP strives to build relationships with the governing bodies of the area, be they Local Municipalities, Municipal Districts, Tribal Leaders, Provincial Government, etc. and other interest groups, be they religious communities, social groups, special needs groups (the disabled, physically challenged, etc. ), the youth and any other group that plays a role in a particular area / community. 3)	To empower these community-based organizations and people to organize, facilitate and deliver the DBSP training in the country and/or region and/or areas in which they work. in order to accomplish the objectives set out above, the DBSP, along with its project partners within a country / region or area identifies, selects and trains up DBSP Trainer/Facilitators and Follow up Mentors/Coaches to conduct all of the DBSP training activities. Ideally, each Trainer/Facilitator and Mentor/Coach should be running, or have run their own successful business to ensure that they are modeling what they teach. * DBSP personnel who come from the area will understand the dynamics of the area - language, socio-economic, political, cultural, norms, poverty levels, contacts and so on. An outsider may, at best, know some of these things and hence, may make some blunders in one of these regards when delivering a program, or following learners up. * Having DBSP personnel in the area means that they are closer in proximity to the learners, and therefore can provide them with a much better service. * In line with our philosophy of working with community-based organisations, having DBSP personnel in the area means that the community based organisation with which we work will have a least one person on hand to whom they can refer all business and business start-up related issues. * The DBSP encourages the community-based organisation with whom we work to have an office, or place, from where the DBSP personnel can operate. By so doing, we further capacitate the community-based organisation, without putting a strain on their resources. * DBSP personnel in the area act as a role model for the learners, because part of our philosophy says that "unless you are a practising entrepreneur, you have no right to teach someone else to start and run a business. " Therefore our DBSP personnel should have a business of their own that they run, and this acts as a showcase to people in the community, especially those whom we train. By adopting this philosophy, we are further capacitating the community-based organisation in the area, as well as having DBSP presence on the ground in a cost effective way. In short, we help set up the DBSP as an ongoing organization in the areas / regions/ countries that we train in. 4) To partner with and license these Trainer/Facilitators and organizations to run DBSP training. The DBSP operates on a simple licensing model, with the licensor being DBSP International, which is based in South Africa. Licensees are those organizations with whom we partner. License fees are paid annually and a small royalty is paid per program trained. For more on this and how it works click here to contact us. 5)	To provide back up support services to these Trainer/Facilitators and organizations. The DBSP then resources its project partners. Some of these resources are: to train up DBSP Trainer/Facilitators and Mentor/Coaches, to monitor progress, to offer ongoing support, to provide upgrades to its training materials and programs, to train up further DBSP Personnel (Trainer/Facilitators, Master Trainers and Follow up Mentor/Coaches), to quality assess the DBSP Personnel in the countries/regions/areas where they work and to conduct area surveys of new prospective areas, where necessary. DBSP International also is in the process of setting up the DBSP Alumni platform, which will be a membership-based association of all DBSP-trained individuals, where learner-related matters, such as partnering, support services, value-added products and services and cross-border trade can be facilitated.